J.A. Medders and Brandon D. Smith. 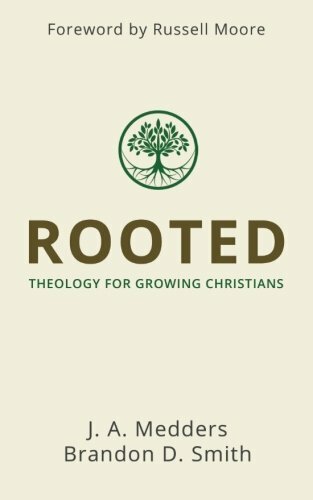 Rooted: Theology for Growing Christians. Rainer Publishing, 2016. 148 pp. $10.97. That’s a comment I overheard at a recent dinner party. Several Christians were talking about God, specifically one of his attributes. Why bother? We bother because God has revealed himself with the intention that we, his children, would know him clearly—not exhaustively, of course, but clearly. The prophet Hosea, despite their frequent and severe failures, emphatically encouraged God’s people to bend their lives so that they might know God better. “Let us know,” he said, “let us press on to know the Lord” (Hosea 6:3). Authors J.A. Medders and Brandon D. Smith wrote Rooted: Theology for Growing Christians to help us do this very thing: to know the Lord. Additionally, what they argue so well throughout the book, as does Russell Moore in his foreword, is that knowledge about God is for the purpose of living. This is why the subtitle is, “theology for growing Christians.” Theology is the water and the sunlight that makes acorns become oak trees. I suppose some might object to this sentence, calling it “imprecise language.” What does “high-octane God” actually mean? This way of speaking, however, when it grows out of the Bible—which it certainly does for Medders and Smith—might communicate better and with more force than using only the expected theological propositions. It’s writing like this that causes old truths to be heard afresh. I think that’s one reason the authors of Scripture did this so frequently. Just to give you one example, consider Romans 13:11–13, “The hour has come for you to wake from sleep. . . . The night is far gone; the day is at hand. So then let us cast off the works of darkness . . . . Let us walk properly as in the daytime.” Here, Paul uses the metaphors of ‘sleeping and waking’ and ‘light and darkness’ to stress the urgency of following Jesus. The alarm clock is ringing, people! Wake up and follow Jesus! I should mention that a few times, at least for me, the conversational tone and metaphors fall just a bit short (e.g., “an atomic bomb of grace,” ). But regardless, their attempt to pair fresh language with sturdy, biblical theology is one of the most enjoyable aspects of the book. We’ve had Rooted in our church bookstore for several months, and I’ll be happy every time we have to restock the shelf with more copies. We are all theologians. While there are a select few on planet earth who get paid to be theologians, the truth is that all humans are in some respects a theologian—we all have thoughts of God, and they are either right or wrong. Theology is all about God: all God is, all he has done, all he does, and all he will do . . . Theology isn’t simply for the mind—it’s for life. (22–23). J.A. Medders also hosts the podcast, Home Row, which I love and wrote about here.